At the Mobile World Congress 2018 or MWC, Asus made a splash with the reveal of three new variants for their Zenfone 5 line – the Zenfone 5, the Zenfone 5Z and the Zenfone 5 Lite. The 5Z features a 6.2-inch, dual-camera smartphone that seemlessly works with a 19:9 all-screen display featuring a 90% screen-to-body ratio, packed in a 5.5-inch body size. It also features the latest Snapdragon chip, the Snapdragon 845. It’s faster than ever before thanks to additional hardware like the Hexagon 685 Vector DSP, Adreno 630 Graphics, and Kryo 385 CPU. Qualcom plays a big role for this series as the Zenfone 5Z also has the Snapdragon X20 Gigabit LTE modem, delivering speeds that surpass the gigabit barrier for a ‘wireless fiber’ experience, as well as integrated 2×2 802.11ac Wi-Fi and Bluetooth® 5 for ultra-low-power wireless earbuds. The extreme-performance ZenFone 5Z comes with 6GB RAM and 64GB ROM, offering breathtaking performance combined with outstanding energy efficiency for long-lasting battery life. ZenFone 5 features an exquisitely crafted design, an amazing dual-camera system, and is powered by the latest Snapdragon 636 Mobile Platform. For an instant blast of extra power, the exclusive ASUS AI Boost — available on both ZenFone 5 and ZenFone 5Z — optimizes performance for games and other demanding tasks. Both the ZenFone 5Z and ZenFone 5 feature intelligent dual-camera systems that adapt and learn, delivering perfect photos every time. Equipped with the latest flagship Sony® IMX363 sensor with large 1.4µm pixels, an f/1.8 wide-aperture lens, 120° wide-angle secondary camera, four-axis optical image stabilization (OIS) and AI-enhanced camera features — including AI Scene Detection for 16 different scenes and objects, AI Photo Learning, Real-time Portrait and Real-time Beautification — ZenFone 5Z and ZenFone 5 encourage creativity and free the user to concentrate on the subject rather than the camera. 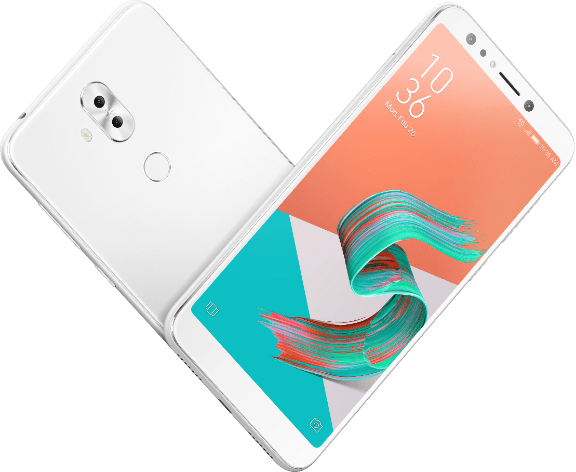 ZenFone 5 Lite is a stylish 6-inch smartphone featuring the world’s first globally-announced true quad-camera system with high-resolution and wide-angle cameras at both front and rear. ZenFone 5 Lite removes the limits on photographic creativity, with a high-resolution main camera — 20MP Sony at the front, 16MP at the rear — and, uniquely, a secondary 120° wide-angle camera at both front and rear. Unlike rival systems, each camera works independently every time for perfect selfies, wefies, landscapes, portraits or groups shots. The 6-inch Full HD+ IPS display has a Full View 18:9 aspect ratio and an ultraslim bezel, making the pocket-friendly ZenFone 5 Lite as compact as a standard-aspect-ratio 5.5-inch phone. Powered by the Snapdragon 630 Mobile Platform, ZenFone 5 Lite combines incredible performance, optimized power efficiency and a 3300mAh battery with advanced security and convenience features — including NFC, triple-slot SIM/microSD card holder, rapid face unlock and fingerprint recognition — for a mobile experience like no other. The Zenfone 5, Zenfone 5Z and Zenfone 5 Lite will be available 2nd quarter of 2018.